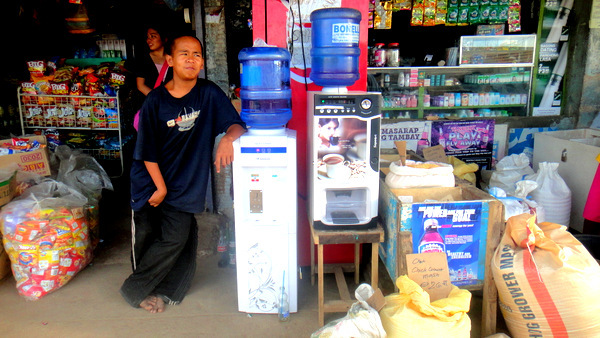 Discovered some shocking major upgrades at Cousin Emma’s Jade Market in Guimaras during the recent “Babes & Beer Tour.” My wife’s relative in the mango province now has coin-operated tubig (water) and kape (coffee) dispensers! 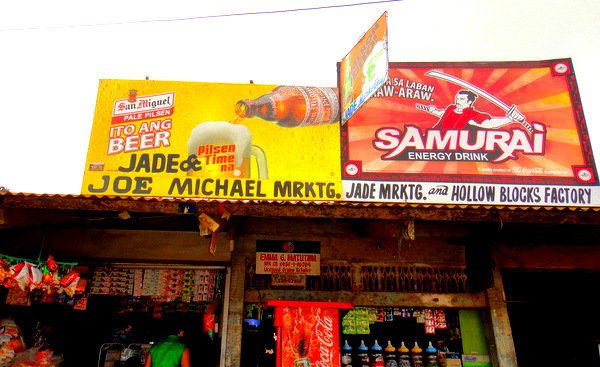 I thought I was hallucinating from too many bottles of San Miguel Pale Pilsen, but it was no alcohol-fueled illusion, the Jade & Joe Michael Mrktg. Store, not to be confused with Emma’s Hollow Block Factory, had entered the modern era. I was amazed to see such high-tech apparatus in sleepy San Miguel. No soda in a plastic baggie with a straw for this establishment. 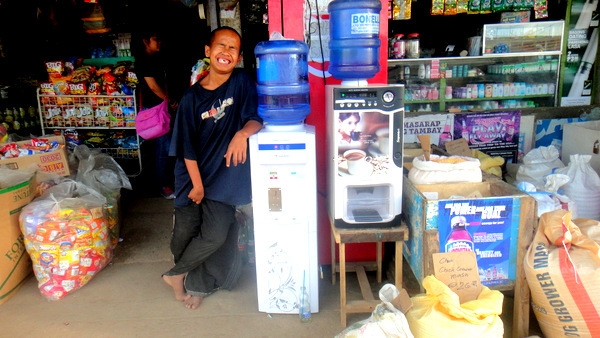 Perhaps these new-fangled gadgets were the reason, Jamie, our amigo from the 2013 Manggahan Festival, was hanging out at the store and leaning on the water dispenser. That’s him in the next photo. I loudly called out to my Filipino friend, but Tom told me not to encourage him. Why not? My asawa and I haven’t moved back to the mango province yet, but when we do, I’m sure that I’ll run into Jamie a lot, as I suspect my American expat friend already does. See the next photo? Yeah, Jamie gladly posed for me with a wide grin. He’s a friendly guy. He has never asked me for money but does have a tendency to follow people around that he likes. But I never saw him the rest of the tour after this initial sighting. Maybe he just likes Tom? 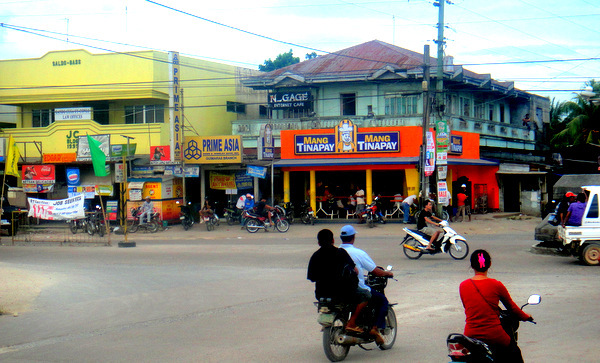 “The New Site” is the location of the newer businesses in the area and is the major market for locals to do their shopping. People from surrounding towns come in on Sunday morning to the “New Site.” Better get there early if you want to buy some fresh fish. It goes fast. And the place does get crowded. 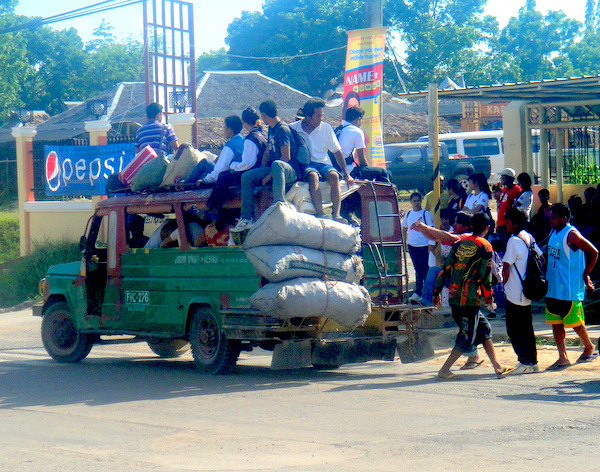 You’ll see plenty of overloaded jeepneys on Sunday morning like the one shown below. I’m sure there must be some law that prohibits the passenger capacity, but as is the case with many rules and regulations in the Philippines, they’re not enforced. My asawa absolutely refuses to let me ride on the top of one of these. The Philippines-based Emperador brand has been the world’s number one selling brandy after more than doubling its volume sales during 2011. 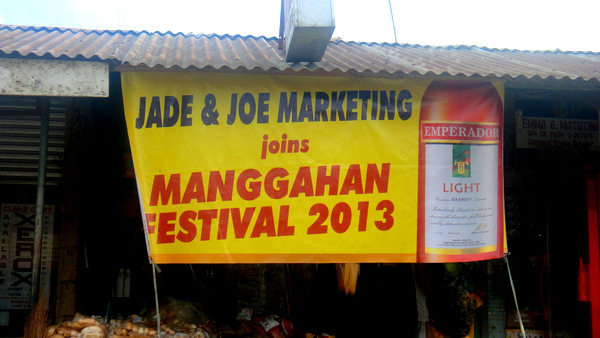 Jade & Joe Marketing took advantage of their advertising campaign to participate in the Manggahan Festival. Beer, rum and brandy sales skyrocket at the market during the annual mango festival. I should have tested out the new water or coffee machines, but I was too busy drinking cold bottles of San Miguel Pale Pilsen with The Tom Cat on our “Babes & Beer Tour.” Maybe next time. Now if Cousin Emma could just install that Red Horse vending machine that dispenses really cold bottles of beer, that move to Guimaras next year would get even better. Looks like a move up in the world… I think you are going to enjoy the move Dave. Good luck. BTW Who is the fine looking young lady?????? Whats with the tongue sticking out lol? You can ride the jeepney onetime with a load of chickens. That was a picture I just added as an afterthought, PapaDuck, from Google Images. Melinda would positively, absolutely, NEVER let me go on the top of a jeepney like that. She has a fit when I hang outside at the rear if it’s too crowded. What ever you do, do not drink Emperador. At the price of a bottle it has got to be bad for you. I know of an English guy who died from drinking a bottle every day for seven years. About two months before he died I warned him that he wasn’t looking too good and should quit the drinking. Unfortunately he didn’t take my advice. I’ll take your advice, Murray, thanks. We had a neighbor in Guimaras who drank Tanduay everyday. Super nice guy but loved his rum. He died last year, only in his mid-40’s, leaving behind a wife and kids and a grandchild. Very sad. Dave, there doesn’t seem to be an option to subscribe to comments on this post. Nope, I’ve taken it down for a while, Lance, sorry. One of my readers was getting too many new comments and I’ve shut it down for now. I Really liked your Cousin Emma’s Jade Market in Guimaras because they were the only store where I could get Grande cans of pineapple juice . 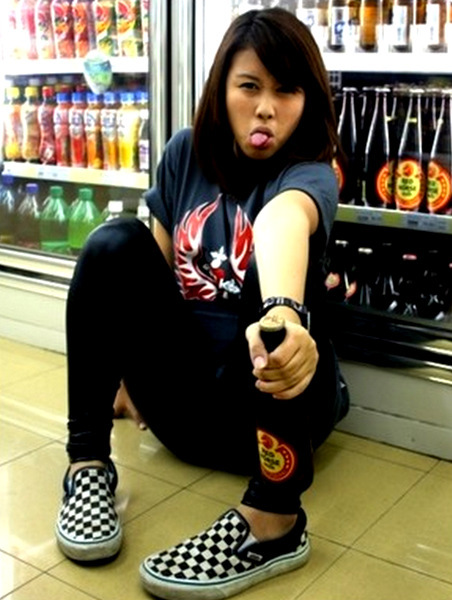 I bet she even remembers me for buying so much pineapple juice. I’m sure Emma remembers you, Fearless Frank. I’ll ask her next time at the store. I have to find out how much that water and coffee costs.